↑ ALL ABOUT HUBBLE — Space Telescope Science Institute. ↑ Hubble's Amazing Optics — Space Telescope Science Institute. 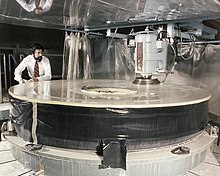 ↑ http://hubblesite.org/the_telescope/hubble_essentials/#how — Space Telescope Science Institute. ↑ Hubble Essentials: About Edwin Hubble — Space Telescope Science Institute. ↑ M. Robberto, A. Sivaramakrishnan, J. J. Bacinski, D. Calzetti, J. E. Krist, J. W. MacKenty, J. Piquero, M. Stiavelli. 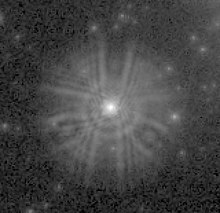 The Performance of HST as an Infrared Telescope. — Vol. 4013. — P. 386-393. — P. 386-393. ↑ Nancy Grace Roman. Chapter 3. Exploring the Universe: Space-Based Astronomy and Astrophysics. ↑ G. Fritz Benedict, Barbara E. McArthur. High-precision stellar parallaxes from Hubble Space Telescope fine guidance sensors. Transits of Venus: New Views of the Solar System and Galaxy. ↑ Burrows C. J. et al. 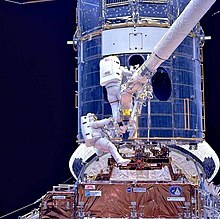 The imaging performance of the Hubble Space Telescope. — Astrophysical Journal — Vol. 369. ↑ И. Лисов. США. Ремонт Космического телескопа имени Хаббла. ↑ Trauger J. T., Ballester G. E., Burrows C. J., Casertano S., Clarke J. T., Crisp D. The on-orbit performance of WFPC2. — Vol. 435. ↑ 47,0 47,1 США. Второй полет к «Хабблу». ↑ W. L. Freedman, B. F. Madore, B. K. Gibson, L. Ferrarese, D. D. Kelson, S. Sakai, J. R. Mould, R. C. Kennicutt, Jr., H. C. Ford, J. A. Graham, J. P. Huchra, S. M. G. Hughes, G. D. Illingworth, L. M. Macri, P. B. Stetson. Final Results from the Hubble Space Telescope Key Project to Measure the Hubble Constant. — Vol. 553.